The Black Panther Party was founded in 1966 by Huey Newton and Boddy Seale in Oakland, California. It was initially organized to protect blacks from police brutality. They evolved into a Marxist revolutionary group that was labeled by the FBI as "advocating the use of violence and guerilla tactics to overthrow the U.S. government." The party had thousands of members and chapters in several cities at its height in the late 1960s. The Black Panthers emerged out of the nonviolent civil rights movement of the early 1960s. Leaders Newton and Seale both began their experience with organized groups as members of the Revolutionary Action Movement, a socialist group with militant and non-violent political activities. Its roots may be also found in the Lowndes County Freedom Organization (LCFO)—an Alabama group dedicated to registering African-American voters. The group was also called the Black Panther Party. The name was later borrowed by Newton and Seale for their California-based Black Panther Party. The Black Panther Party had a specific platform laid out in 10 points. It included goals such as: "We want power to determine the destiny of our black and oppressed communities," and, "We want land, bread, housing, education, clothing, justice, and peace." It also outlined their key beliefs, which centered around Black liberation, self-defense, and social change. In the long term, the group aimed rather vaguely at a revolutionary overthrow of the white-dominated status quo and black power. But they had no more concrete platform for governing. They took their inspiration from a combination of socialist intellectuals, combining their thoughts on the role of class struggle with the specific theories about black nationalism. The group's violent stance was by no means secret; in fact, it was central to the Black Panther's public identity. Author Albert Harry, writing in 1976, observed that the group's "paramilitarism was clearly visible from the start, as Black Panthers strutted around in their black jackets, black berets, and tight-fitting black pants, their pockets bulging with side arms, their clenched fists high above their defiant heads." The group acted on its image. In some instances, members would appear en masse and simply threaten violence. In others, they took over buildings or engaged in shootouts with police or with other militant groups. Both Black Panther members and police officers were killed in confrontations. The Black Panthers were not solely focused on violence. They also organized and sponsored social welfare programs, the most famous of which was their Free Breakfast for Children. In the 1968-1969 school year, the Black Panthers fed as many as 20,000 children through this social program. Eldrige Cleaver ran for president on the Peace and Freedom Party ticket in 1968. Cleaver met with North Korean leader Kim Il-sung in 1970 and traveled to North Vietnam. He also met with Yasser Arafat and the Chinese ambassador to Algeria. He advocated a more revolutionary agenda and after being expelled from the Panthers led the Black Liberation Army splinter group. The Panthers worked on electing members with unsuccessful campaigns such as Elaine Brown for Oakland City Council. They supported the election of Lionel Wilson as the first black mayor of Oakland. Former Black Panther members have served in elected office, including U.S. Representative Bobby Rush. May 2, 1967: About 30 armed Black Panther members enter the California legislature to protest consideration of outlawing the right of private citizens to bear arms. There was no violence, but the spectacle is well remembered and brought the group into public light. At that time, open carry of weapons was legal in California. The Black Panthers had exercised this right in being present at arrests and stationed at the legally-allowed distance while displaying their firearms. 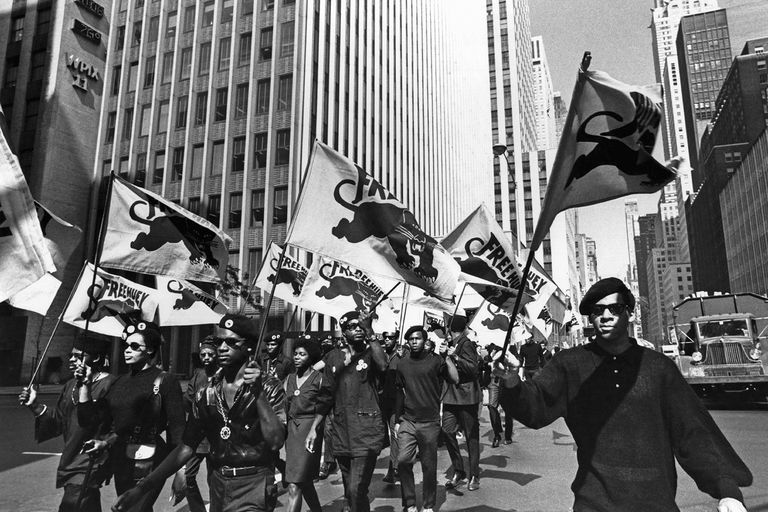 August 1967: The FBI includes the Black Panther Party in their counterintelligence program, COINTELPRO, aimed to discredit and neutralize subversive organizations. They conduct hundreds of actions to weaken the party. October 28, 1967: Party leader Huey P. Newton is arrested after Oakland police officer John Frey is shot and killed performing a traffic stop of Newton, in which another officer and Newton were also shot. This incident led to the rallying cry of "Free Huey," which galvanized support for the party among other activists. Newton was later convicted of voluntary manslaughter, a conviction that was later overturned. April 6, 1968: An armed confrontation erupts between Black Panthers and police led to a 90-minute confrontation at a building housing Panthers. Eventually, the Panthers surrender. Over the course of the day, at least four policemen are wounded and one killed. One Panther member, Bobby Hutton, is killed by the police and seven others are arrested. Hutton's death becomes a rallying issue. 1969: Gun battles take place between Black Panthers and rival organizations, including one in Campbell Hall on the UCLA campus in 1969. Panthers torture and kill a suspected informant, Alex Rackley, which leads to a trial of Bobby Seale alleging he ordered the killing. A hung jury resulted and there was no retrial. December 4, 1969: Another well-remembered instance of violence is instigated by the FBI, which provides the information needed to raid the Illinois Black Panther Party head's apartment. Two members of the Black Panthers were killed by gunfire. The event is remembered partly for the disproportionate firing: evidence revealed later that the police fired up to 99 bullets, while the Panthers may have shot one. It is also remembered because the information required for the break-in was obtained by an FBI infiltrator in a period when surveillance of the domestic group had been approved. The charges against the seven survivors of the raid were later dropped and Hampton's family won a $1.85 million wrongful death settlement from the city of Chicago. December 8, 1969: The LAPD conducts a SWAT attack on the Los Angeles Black Panther office, firing thousands of rounds and resulting in no deaths but a handful of injuries on both sides. 1971: After a fall-out between Newton and Eldrige Cleaver, the party splits into factions and engage in assassinations of each other's members, with four killed. 1974: Nine Panthers, including Newton, are arrested for assault on police officers. Newton is also charged with murdering Kathleen Smith. He flees to Cuba. Panther bookkeeper Betty Van Patter goes missing and is found beaten to death, with Panther leadership suspected. In 1977, there was an attempt to assassinate Crystal Gray, a witness in the Smith murder. Elaine Brown was appointed Chairwoman of the Panthers in 1974 as Newton went into exile. Membership in the Panthers declined precipitously throughout the 1970s and was down to a couple dozen by 1980.